Don’t drown your bathroom in makeup, skincare and fashion products. Keep what you can out of the bathroom and, if possible, keep them all stored in cabinets or shelves. You want your bathroom to look clean and airy, so hide as much as you can and only show things such as the hand soap on the sink, or towels on the hangers. Bundle up your toiletries into groups when you store them away so that they’re easier to access and you won’t feel like you need to open two different cabinets just to clean your teeth. For instance, have one cabinet dedicated to dental care, one for hair styling, and another for skin products. 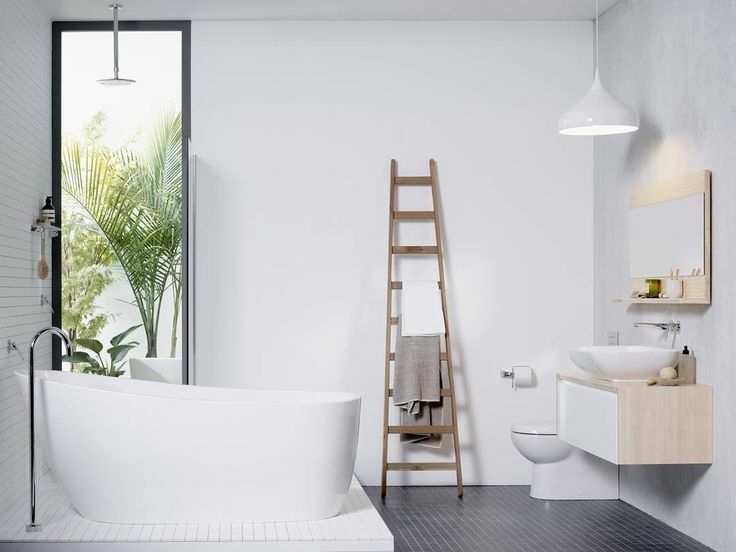 By using soothing pastel colours or bright whites, your bathroom can look airy, heavenly and calming. Try to avoid dark colours as much as possible because it’ll make your room feel tighter and smaller. However, darker colours can sometimes feel more intimate and relaxing, and woody textures and colours can give your bathroom a natural look when accompanied with some foliage. Speaking of foliage, something that a lot of professional spas have in common is they aren’t afraid to use plants. Get a simple-looking plant pot, dig up some of your favourite flowers from the garden and then add them to your bathroom. If you don’t want to worry about caring for the plants, then artificial plants also work. There are plenty of ways to keep your bathroom clean, but nothing works better than some cleaning products and a sponge. There are times when you’ll want specialised cleaning products. For instance, if you use Nanokote glass coating, you’ll be able to keep your shower screens cleaner for longer, resulting in less overall cleaning and more time spent indulging. If your bathroom hasn’t had an upgrade for a long time, then consider some small DIY improvements. Replacing something like the toilet roll holder can add a significant amount of change to your bathroom and it’s simple to do. Replacing the shower curtains is also easy and needed when you have to wash it, and changing your shower head for something luxurious like a massaging shower head is also a great idea. Lastly, you need to fend off the ultimate enemy to a luxurious bathroom: mildew. Make sure you leave the windows open to let the hot air escape. If you don’t have windows, ensure the extractor fan is working correctly and isn’t clogged, and leave the door open to let it dissipate into the rest of your home.